I get a lot of e-mail. Most of it is trying to sell me things or trying to tell me how to sell things to someone else. The content of the email was a sales pitch for a book that had a chapter dedicated to how to prepare for a recession. Now, I’m no economist, so I don’t really know if a recession is coming soon, but there probably be another one some day. What I do know is that the e-mail in my inbox was written to instill fear. It was written to sell books. And making a purchase based on fear is a bad idea. A book with a single chapter telling what to do to prepare for a recession isn’t going to help all that much except for lighten your wallet. Sure, you might glean a few tips, but let’s be honest, being financially prepared for whatever the future holds is a pretty big job. It’s not something that you approach once and you’re done. It’s not something solved with bullet points and sound bites. 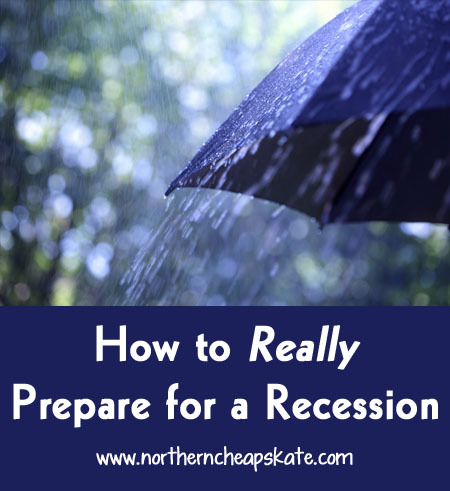 It doesn’t really matter if a recession is coming or not, because we all know that there are times in our life when stuff happens. We need to be prepared for those rainy days. Being financially prepared is about rolling up your sleeves and doing the work of really managing your money every single day. It means analyzing your situation, your own emotions toward money, and making a plan. It means getting creative when there’s more month than money. It means learning contentment and focusing on what’s most important to you. Money is just a tool. It doesn’t make you happy. It doesn’t make you a better person. It just means that you can buy stuff. And stuff doesn’t really make you happy or a better person either. Learn how to use the tool in the best way. Every. Single. Day. That’s how to really prepare for a recession.